Explore randomly-generated worlds and build amazing things from the simplest of homes to the grandest of castles. Play in Creative Mode with unlimited resources or mine deep into the world in Survival Mode, crafting weapons and armor to fend off dangerous mobs. Create, Explore and Survive alone or with up to 8 'crafters together online, while 4 can join each other in local multiplayer on the TV or in tabletop mode, supporting both split screen and the Pro Controller. 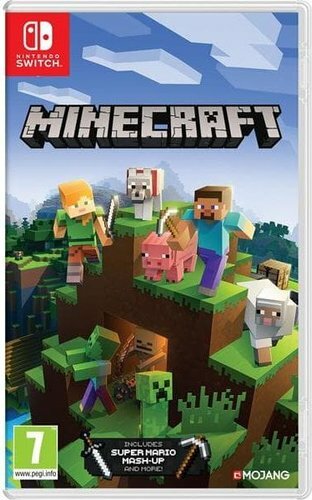 Compete with your friends in Battle, Tumble or Glide* - mini games for Minecraft console editions where you fight for survival and high scores; strategy, and sometimes just pure luck will make you the winner. Minecraft on Nintendo Switch includes six content packs in addition to the Super Mario Mash Up which delivers. Super Mario World itself! Professional Minecraft builders have remade the likeness of the Mushroom Kingdom and beyond, with Mario-themed versions of the Overworld, The Nether and The End for you to explore. So many Mario-inspired surprises to discover, from islands shaped like Warp Pipes to towering sculptures of Nintendo's iconic characters. We've recreated villainous hideouts, too: like Bowser's Castle, Bowser's ship, and Boo's House.